Applications of high-field terahertz pulses are attractive in physics and terahertz technology. In this study, two applications related to high-intensity terahertz pulses are demonstrated. The field enhancement effect by subwavelength metallic microstructures is utilized for terahertz excitation measurement. The spin precession dynamics in magnetic materials was induced by a terahertz magnetic field. Spin precession was amplified by one order of magnitude in amplitude by the enhanced magnetic terahertz field in orthoferrite ErFeO3 with metal microstructures. The induced spin dynamics was analyzed and explained by LLG-LCR model. Moreover, a detection method for terahertz pulses was developed using a cholesteric liquid crystal at room temperature without any electronic devices. 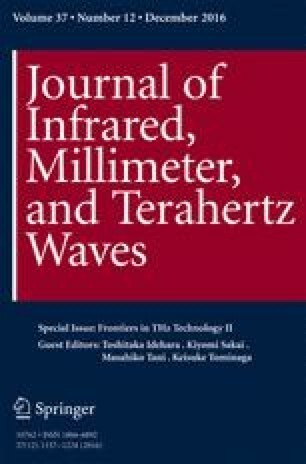 The beam profile of terahertz pulses was visualized and compared to other methods such as the knife edge method using pyroelectric detector and micro-bolometer array. The liquid crystal terahertz imager is very simple and has good applicability as a portable terahertz-sensing card. This work has been partially supported by a Grant-in-Aid for Scientific Research on Innovative Areas (No. 22109003) from the Ministry of Education, Culture, Sports, Science, and Technology Japan (MEXT) and a Grant-in-Aid for Scientific Research, KAKENHI, for Scientific Research (B), (Nos. JP25286063, JP26287060, JP16H03886), and for Challenging Exploratory Research (Nos. JP24656043, JP26600109) from Japan Society for the Promotion of Science. NEC, http://www.nec.com/en/global/prod/terahertz/. Accessed 1 March 2016. Ophir Photonics, http://www.ophiropt.com/laser-measurement-instruments/beam-profilers/products/industrial-applications/the-cameras/pyrocam. Accessed 1 March 2016. Gentec-EO, http://gentec-eo.com/Content/downloads/thz-detectors/Gentec-EO_THz_Detectors_2012_V2.0.pdf. Accessed 1 March 2016.